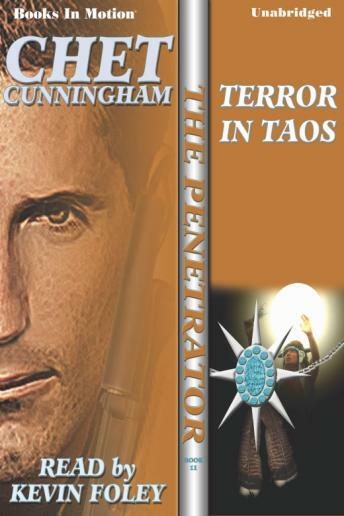 Mark Hardin is known to his enemies as The Penetrator. He penetrates in several ways: by fighting his way in, by easing in...or by dropping in via parachute. Mark Hardin is dropped through the air, scanning the desert for David Red Eagle's smoke signal, his mind flashed back to similar jumps in Vietnam. Another time, another enemy. In the fetid rice paddies and rubbled hamlets, the enemy had a yellow skin and slanted eyes. Today Hardin would be fighting foes on his own kind, men of white skin and red skin. It all started with the theft of some valuable turquoise and silver relics and the murder of an Indian holy man. It would accelerate with the entry of militant young Indians, State Troopers, the National Guard...and the Mafia. It would climax in a desert bloodbath!